QUESTIONS? Ready to see some beautiful Fort Myers Beach homes in person? 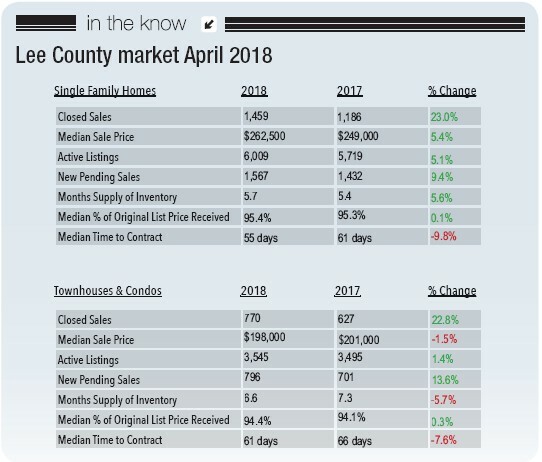 Closed sales and new pending sales in Lee County showed healthy increases in April. Single family homes and townhouses and condos sat on the market for less time than in 2017. Broken down by city, Estero and Fort Myers Beach saw massive jumps in the number of homes sold. There were 79 closed sales in April compared to just 38 last year, which is an increase of nearly 108 percent. On Fort Myers Beach, 21 homes sold compared to 11 in April 2017, a 91 percent difference. Lehigh Acres, North Fort Myers, Pine Island and Sanibel/Captiva also had large increases in the number of closed sales last month. Closed sales were up 23 percent for single family homes last month. In 2017, there were 1,186 closed sales, compared to 1,459 last month. A total of 627 townhouses and condos sold in April 2017, compared to 770 last month, an increase of 22.8 percent. Active listings were up for both categories. There were 6,009 active single family home listings last month, up 5.1 percent from 5,719 in 2017. There were 3,545 active listings for townhouses and condos in April — a slight increase from 2017 when there were 3,495. The month’s supply of inventory increased 5.6 percent for single family but dropped 5.7 percent year-over-year for townhouses and condos.